The Ball Aerospace JPSS-1 for NOAA and NASA. Image Credit: Ball Aerospace & Technologies Corp.
Boulder, Colorado. September 5, 2014 – NASA has awarded a sole source contract modification to Ball Aerospace and Technology Corp. of Boulder, Colorado, for the Ozone Mapping and Profiling Suite (OMPS) for flight on the Joint Polar Satellite System-2 (JPSS-2) mission. The JPSS-2 mission is funded by the National Oceanic and Atmospheric Administration (NOAA) to provide global environmental data in low Earth polar orbit in support of NOAA’s mission. NASA is the acquisition agent for the flight systems and components of the ground system. Under this contract, Ball Aerospace and Technology will manufacture, test and deliver the OMPS instrument, support instrument integration on the JPSS-2 spacecraft and provide launch and post-launch support. The OMPS instrument will be similar to the OMPS currently flying on the joint NASA-NOAA Suomi NPP mission and planned for the JPSS-1 mission. JPSS-1 is being planned for launch in 2016 and JPSS-2 is planned for launch in 2021. OMPS will monitor ozone from space, collect total column and vertical profile ozone data, and continue the current daily global data provided by the Solar Backscatter Ultraviolet radiometer-2 and Total Ozone Mapping Spectrometer. The collection of this data contributes to fulfilling the U.S. treaty obligation to monitor the ozone depletion for the Montreal Protocol to ensure no gaps on ozone coverage. 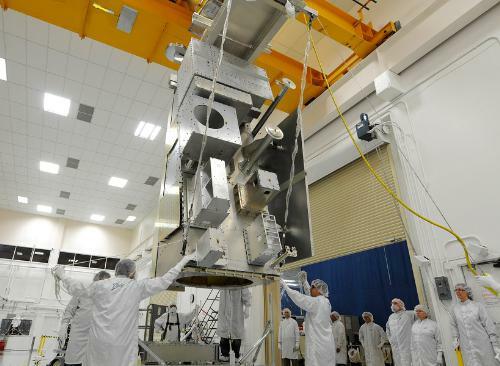 JPSS-1 is the first operational version of the next generation of satellites to be managed by NOAA with NASA as the program’s procurement agency.